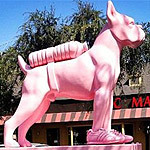 DEFINING CHARACTERISTICS: Bright pink in color; wears two sneakers on its front paws and a “petbottle” strapped to his back (as any pet preparing for summer in L.A. might be prone to do); can stand remarkably still for hours on end. 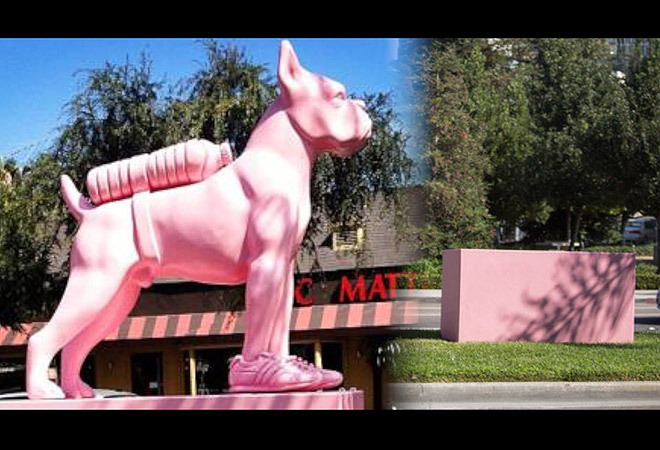 A 200-pound bubblegum–pink dog statue has been pinched from its pedestal. It was last seen at heel on the corner of Santa Monica Boulevard and Holloway and is thought to have been stolen between the hours of midnight and 8 a.m. on June 10th, just after the gay pride parade. Does not answer when called seeing as it’s made of resin. Any leads should be reported to the West Hollywood Sheriff’s department. Previous articleFoam Finger: Call Off the Changing of the Guard, Chris Paul is Staying in L.A.
Next articleEight Crimes That Changed L.A.